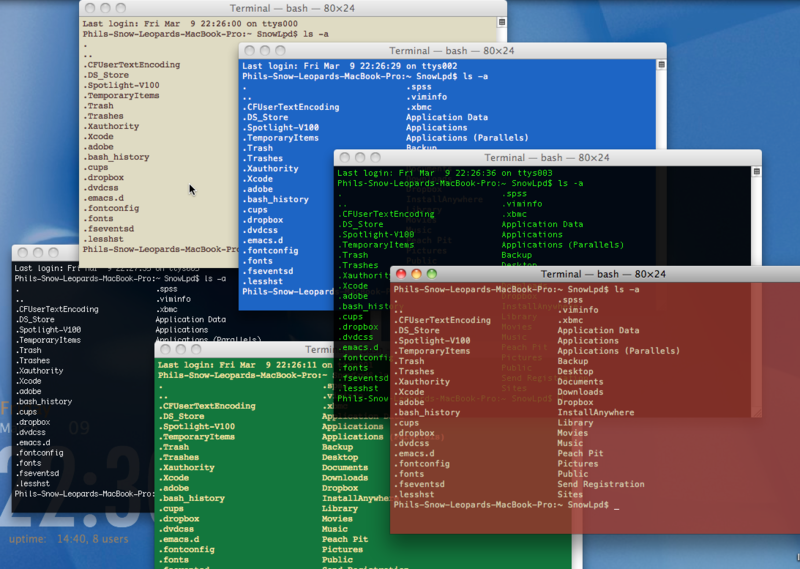 In the last post, we learned how to see all the contents of a folder – invisible and visible files – in the Terminal. However, most of us prefer working in the GUI, so this post is going to show you how to work a bit of Terminal magic to easily turn on and off your invisible files and folders in Finder and the desktop. (note that all commands in these posts should always be assumed to be case-sensitive). Now switch out of Terminal and have a look at Finder or your desktop. You should see some ‘hidden’ files now in a sort of greyed-out 50% opacity (files like .DS_Store). If you can’t see such files, go back and check that you typed or copied the entire command correctly. 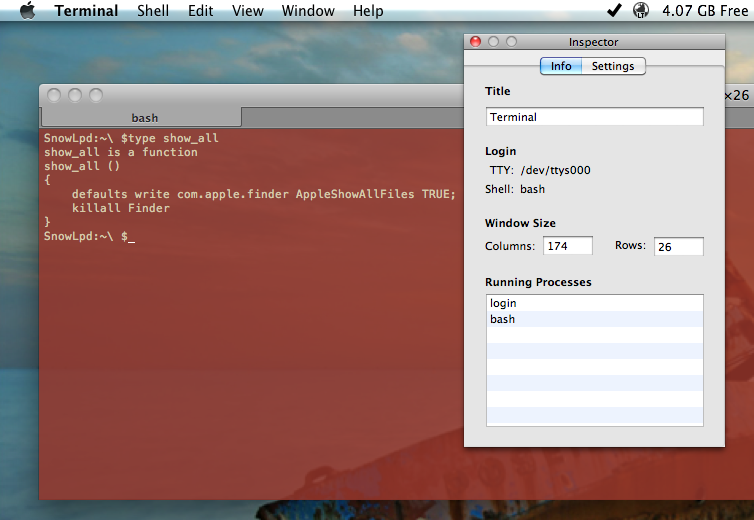 Assuming you can now see your invisible files in Finder, switch back to Terminal. Press the up arrow key on your keyboard. Notice that the last command you typed reappears. That’s a handy trick to remember. You can move between your previous commands with the up arrow and down arrow keys to save time re-typing or modifying commands. In this case, we want to use the last command again, but we also want to modify it. Use the left arrow key to move the cursor back to “True” and then use delete to remove “True”. Leave the cursor where the letter ‘T” was and type FALSE. Make sure the semi-colon ; is still there. Press Return — you don’t need to move the cursor to the end of the line as you would with a word processor. You can hit Return no matter where the cursor is in the command line and it will execute (or try to) whatever is typed on the whole of the command line. Now, if you switch back to Finder or the desktop, you should see that all your hidden files have disappeared again. OK, now that we have tested these commands to check that they work, let’s do something a bit more useful with them. to replace the word “TRUE” in the last command with the word “FALSE”. Hit Return to execute it. Using the pattern ^error^correction is a great way to both correct commands you type incorrectly and to run two commands one after the other that have only one term or option different. Back in Terminal, hit the up arrow to bring the last command back onto the command line. This time, I want you to hit control-A on your keyboard. Notice that this brings the cursor to the start of the command line, which is what we want as we’re going to type in a new command before the “defaults…” part. On the keyboard, press control-E. This takes the cursor to the end of the command line (remember: control-A to go to the start, control-E to go to the end). and press Return one more time. As you can see, after testing those two commands on the command line, we’ve now sent them to the .bash_profile file, saving us the job of typing them out again (and possibly making an error when we do so). However, we can’t leave the commands like that – if we do, then they will run every time we log into the Terminal. Rather, we want to use these commands to define functions, just like we did last time with ‘show’ and ‘up’. To do that, press control-L on the keyboard, then use the down arrow key to bring the cursor to the beginning of the first line with a ‘defaults’ command on it. Use the down arrow key to move the cursor down to the line below the “Defaults…FALSE” line and press Return. Use the down arrow key to move the cursor below the “Defaults…TRUE” command. (If you can’t go below the last typed line, then on the keyboard press control-E to move the cursor to the end of the line, the press Return). to logout. Then press command-W and command-N to close and reopen Terminal. What did we do this time? We just made some new, easy-to-remember commands to show and hide our hidden files in Finder and the desktop. On the way, we learned how to append commands to files using the >> function, as well as how to move the cursor to the beginning and end of a line using ‘control-A’ and ‘control-E’ respectively. We also learned how to recall previous commands on the command line using the arrow keys and how to correct or modify previous commands using the ^error^correction pattern. Wow, you’ve come a long way in two short tutorials! This is the first in a series of planned tutorials for anyone who wants to find out what Terminal can do and how they can use it to increase the usability of their computer. Unlike other Terminal tutorials, I’m going to assume that you’re not interested in giving up the desktop for the command line to do things like move and copy files that you can do more easily in Finder. Rather, I’m only going to focus on those things that it’s generally more difficult (or impossible!) to do in the GUI than it is in Terminal. Let’s get started. Open Spotlight (try the hotkey command + spacebar or click the spy glass in the top right corner) , then type term and press Return. When Terminal opens, the first thing you may want to do is make the text a bit easier to see in the Terminal window. Hold down command-shift-+ to increase the size. Try it a couple of times till the text is a comfortable size. If you overshoot, just use command- – (minus key) to reduce text size. Now you’re sitting comfortably in your Terminal window, let’s learn our first spell. Actually, we’re not going to learn one so much as make our own! There’s a space between the ‘s’ and the dash, and all the letters are lowercase except the ‘F’, which must be uppercase. Now hold down the control key on your keyboard while you first press x and then c. Notice at the bottom of the screen you get a ‘save’ warning. Press the y key on your keyboard, and you should find yourself returned back to the Terminal prompt. Type exit at the prompt to logout of the Terminal, and then on the keyboard press Command-W to close the window, and Command-N to open a new Terminal session. As you can see I’ve annotated the screenshot to show some of the features that the show command gives us. First of all, notice the file and folder names that begin with a . dot. These are your hidden files and folders (Remember: they are usually hidden for a reason, so don’t go messing with them unless you know what you’re doing!). The show command also helps us distinguish between files and folders by appending a / slash to the end of folder names. Although not shown here, you may also see some names with an * at the end. That means it’s an executable file — in other words, its purpose is to run some programme or command. The show command is very useful for seeing exactly what is in a folder, but of course we need to know how to move between folders in order to see anything other than our own home directory. Now I can see all the options, and how much I have to type to make a unique choice. In this case, I only have to type either ‘cd Sh’ or ‘cd Sn’ to allow Terminal to know which one I want when I press the tab key. Pressing Return after the tab completion will take me to the folder. Try it with a folder from your own list. After changing to a new folder, perhaps your screen is getting a bit messy. Let’s clean it up before doing show again. On the keyboard, press control-L to get a clear screen (notice that all your previous commands and outputs are still available if you scroll up!). Now type show again to see your files and folders, pick a folder (if there is one), and type cd plus the first few letters of the name. Fill it out with the tab key and then press Return. Again, type show to find out what’s inside. You can keep going deeper into the directory tree by using cd and show on any folders you find. So now you know how to move around and see all the hidden and un-hidden contents of your drive, go and explore and get yourself used to these first basic commands. When you’ve finished with your Terminal session, type exit and press Return. You can then close the window and go back to GUI land! 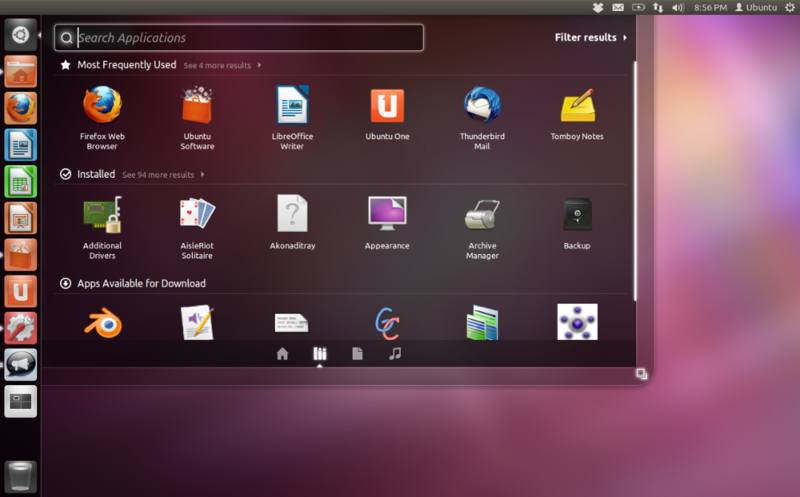 If you have Parallels or VMFusion, you can download and run Ubuntu as a guest OS for free. 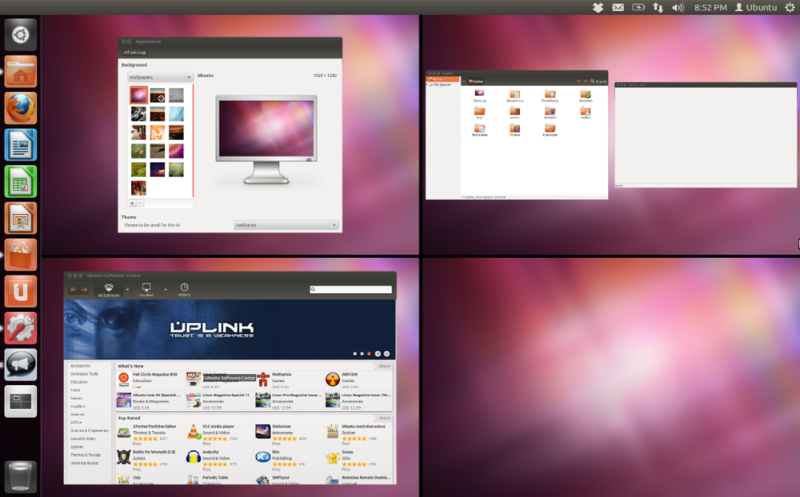 Ubuntu has some nice features including a Spaces-like desktop switcher and loads of free software available in the Ubuntu App Store. For those still on Snow Leopard but wishing they could have the benefits of iCloud, Ubuntu provides an interesting option: the open source OS comes with its own Cloud service and 5GB free space. You can sync it with Windows, Android and iOS, and it even allows you to stream music from the Cloud to your devices. If you run Ubuntu in Parallel’s ‘Coherence’ mode, you can take advantage of Ubuntu’s mail, calendar and music apps and have all your other devices synced to your Mac. 1. Go to the Ubuntu download page, and choose either 32-bit or 64-bit depending on your current Mac OS (if you’re running SL 10.6.8 or later, go for the 64-bit). Ignore the advice about creating a CD or USB stick (it doesn’t apply to us as we’re going to install it via Parallels). 2. Click the big red/orange ‘Download’ box, and make a cup of tea while the .iso file downloads to your computer. 3. After the download has finished, start up Parallels. From the Parallels Desktop menubar, choose File > New. 4. From the resulting dialogue box, click the drop down menu and select Choose an image file…. Browse to your downloads folder and choose the .iso file you downloaded in step 1. 5. From here on in, Parallels will pretty much take care of everything else for you. Your virtual machine will restart a couple of times and you will get asked to choose a couple of options (like setting a language, region and password), but it’s all fairly self-explanatory. Accept the default options for now. When the install finishes, the first thing to do before trying it out is to set the amount of RAM available to the Ubuntu install. You’d want to set this to at least 2GB, but 4GB is better to get a really fast machine. 6. 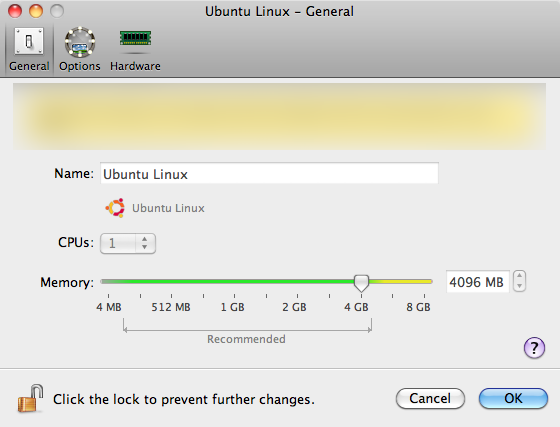 To set the RAM, first shut down Ubuntu. Do so by going to the Parallels menubar and choosing Virtual Machine > Shutdown. 8. Finally, go play! Depending on your download speed, the whole procedure shouldn’t take much more than an hour or so. If you need documentation, just go back to the Ubuntu site and you’ll find plenty of resources there.